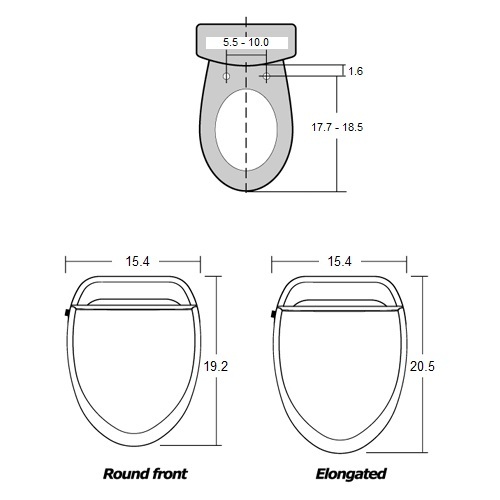 The USPA 6800 bidet toilet seat comes with several additional features to go along with its frontal and posterior cleansing. It offers top-of-the-line cleaning with its massage functions and water pulsation. Many features can be customized including the wash nozzle position, water pressure, and water temperature. After washing, enjoy a hands-free experience with the warm air dry. It includes a heated toilet seat, which provides just the right level of warmth you choose with the adjustable seat temperature control. This unit also features a soft-closing seat and lid. With an occupied seat sensor, self-cleaning wash nozzles, and a power saving mode included with all the other great features, this is a model your whole family can enjoy. One of the things we noticed about the USPA 6800 is that it’s a bit more compact than the other models we carry at bidetsPLUS. When you combine this with the beveled edges that go around the lid, it gives a contemporary look. For our official review of this seat, you can click on the following link: bidetsPLUS' USPA 6800 Review. But continue reading below for our quick thoughts on this model. The unit is operated with a wireless remote control which comes with a mounting bracket so it can be mounted on the wall. Wash functions include both posterior and feminine wash features. 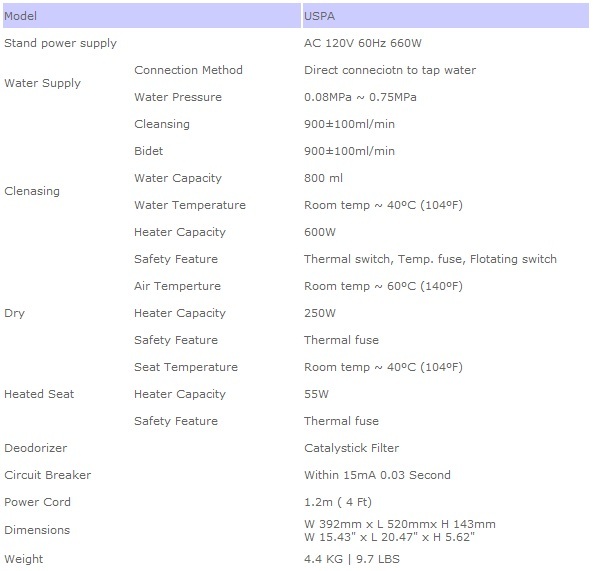 Water temperature is adjustable, as is the water pressure. You can even adjust the position of the wash nozzles, so that the water stream cleans you most effectively. As for non-wash features, it includes a warm air dry, temperature-controlled heated seat, soft closing seat and lid, and an air deodorizer which helps remove unwanted odor from your bathroom. One difference worth mentioning between the USPA 6800 and other seats in our store, is that the USPA 6800 has the electric cord centered in the rear of the seat. This allows you to run the cord to the left, or the right, depending on where your power outlet is. Another difference is the inclusion of a "kids mode" which activates a low pressure wash that's just right for children. We hope you've learned more about this model here at bidetsPLUS! I’m so pleased with USPA 6800. This is my first experience and it is great. My kids and I we all love it. The remote is fantastic.!!! We are very pleased with our USPA 6800. This is our third one and all have worked very well. Great remote too. After our recently trip to Japan, All the hotels in Japan are equipped with this kind of toilet ...but their brand name is Toto... I bought this model online... My restroom did not have an electrical outlet but I installed an electrical outlet myself then installed the Bidet USPA 6800....It works so good....It's amazing....Just like we were in Japan! This product is great. I have this bidet @ home and @ work. I have had one @ Home for over 4 years and it has worked perfect since day 1. It has great features and it’s very easy to set up and use. Bidet’s plus is great and easy to deal with. Highly recommend!!! We have had this same bidet previously. We needed a new one and found BidetsPlus online. The new one has the elongated seat which is great and our plumber loved the ease of installation. (We installed the first one but we have gotten older. The plumber wanted the make and model number and said he liked it better than a Toto. 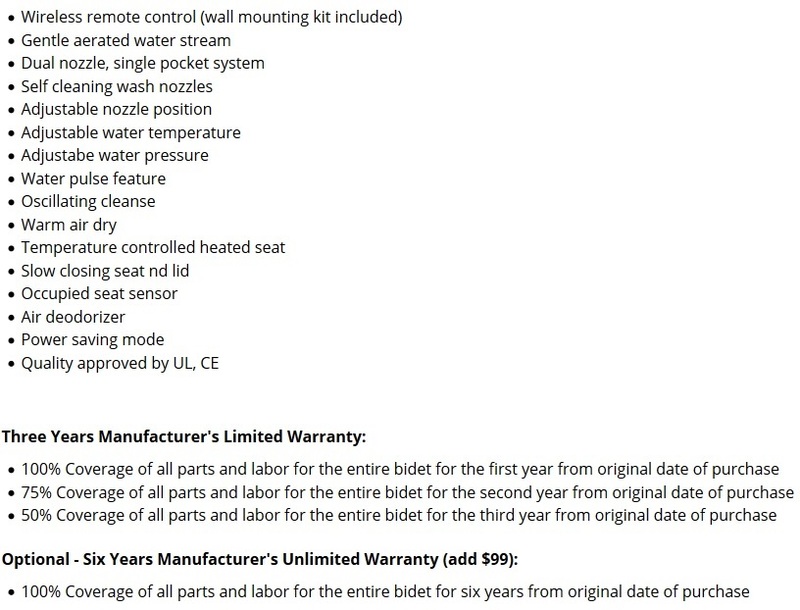 And given this winter, who doesn’t need a heated toilet seat! Product works well even though we have only had it for a couple of weeks. Easily installed. Just getting used to remote, lots of stuff to learn and try out. Would definitely recommend. We have never owned a bidet before but so far this is the best seat we could have ever asked for! It was super easy to install and I love the fact that the remote does not have to be fixed onto the toliet just in case when company comes over I can put the remote somewhere else. Wonderful product and wonderful company!